IPCC reviewer: "don't cover up the divergence" | Watts Up With That? IPCC reviewer: "don't cover up the divergence"
November 26, 2009 in Climategate. Hiding right out in the open !!!!!!!!!!!! This just keeps getting better by the day !!!! This could be a diversionary tactic in the run-up to Copenhagen. While a lot of people are pulling this leak to bits, slippery and sneaky pollies insert not only an ETS/Cap & Trade policy, but other draconian policies too. All the data and what models exist seem to indicate that we have reached a peak in oil production and a long steady decline is ahead of us. This chronic oil depletion crisis happens to be occurring in parallel with climate change awareness, although peak oil has gotten much less publicity. This is serious stuff, yet the government barely acknowledges its significance because it has serious ramifications on the economy. So, unfortunately, much of the public has no awareness of our petroleum predicament, and further, a significant number of people actively question the phenomena of peak oil. depletion skeptics. There is no arguing this, as you hear it on radio talk shows constantly and you read about it in opinion pieces such as by George Will and a host of others. So the challenge to the climate science skeptics who claim to be hot-shot statistics wizards — why don’t you “audit” those of us who post on http://theoildrum.com and other oil depletion blogs? We are waiting, all of our data is open, we only discuss matters in open daylight, and we will kick your asses with our skillz. Seriously, we have to change our energy policy and soon. Whether it is due to a crisis in climate change, or due to an inexorable decline in easily accessible petroleum, things will change, like it or not. Here is your chance once more to prove someone wrong. Good luck. And BTW, whatever data we uncover does not belong to us; oil reserve estimates are usually locked up in some corporate or foreign nation-state vault totally immune to FOIA requests. Double good luck in getting that. You will get to see how the people with the REAL money play hardball. you should be ready for your next conquest. Yes, we are waiting for you, and we knew this day would come. As with Watergate, Plame, and Martha Stewart, it’s not the act that gets you caught it’s the cover-up. Was this “discussed” in any of the Assessment Reports? The pollies have made up their minds based on the opinion polls. They are going to Copenhagen just like going to Iraq– based on the same quality of information and intelligence. At least for the next two to three years they could wave the flags “Mission Accomplish”. When the quality of the intelligence or information becomes known they dont care. They will be out of office by then. In fact the pollies will be the first one to claim they have been misled. After all they are just decision makers, they are not climate scientists. They dont care about history. If climate science will start to unwound, the world will have move on to another type of hysteria. The good thing about climate science is the very long shelf life of the hysteria. Climate Change hysteria is not unique. In fact public policy specialist have a special term for this phenomenon. It is called “moral panic”. This is the irony of climate science. There professionals but the field has really been hijacked by movie stars, MSM personalities, railway engineers, theologians, etc. The top science societies have been hijacked and are freely supporting the principles that destorys the credibility of science. Hopefully the climategate issue will develop a wide base of intellectuals who will lead the revival of science who will counter balance the pseudo scientific appeal of the movie stars and carpet baggers riding on the economic benefits of climate change. No matter how well meaning, anything less than straight ahead truth will get you in the end. That’s what always happens to politicians, but it’s sad that scientists are also getting into it. Who coined the word climategate? Hmmm how long before this is dubbed ClimateGate? Bishop Hill is getting into a series on the codes. There must be a thousan knowledgeable people investigating them as well. E-mails; Harry’s red me file and the codes. The person who released this knew she was sowing all the clues …yeah! Or an auditor whose name must not be mentioned. Response: “No, they are increasing in numbers”. twit……’peak oil’ as in maximum reserve size or ‘peak oil’ as in a maximum daily production rate?…….the latter is the only one that may have some legs….all you really need though is after Mann et al get skidded they can be simply rehired to massage daily max output datas & simply hide the production decline………. Remember everyone that skeptic scientist Tim Ball will be on Coast to Coast AM tonight in the last two hours. That’s 12 -2 Pacific, 3-5 ET. Perhaps if the current administration would let us recover some of this oil, it would help us recover, somewhat, from our ever-burgeoning national debt in the U.S. They must have an alternate definition of “inappropriote” that I am unaware of. Bulldust did it. He must be the “hacker”. I don’t know where I saw this, but it is like driving off a bridge. Here are two MSM efforts to expose climategate. Sorry for the constant posting here. Once I see MSM carrying this more I’ll find a new way to voice my concern. Thanks for all the help on this site. In the early 70s, OPEC was formed. One of their early decisions was to allocate quotas for production based on each country’s reserves. Almost immediately, one member country after another doubled their official reserve numbers. And, though only negligible new reserves have been found in OPEC countries, those doubled reserve figures have never decreased significantly – after 40+ years of continued production. But, while it’s easy to massage reserves (on paper), actual production (the real asset) either is there or it’s not. Also, keep in mind that OPEC (and other oil producing countries) continue to increased their domestic demand for their produced oil. Using Mexico as an example, while they still produce a lot of oil, they’re about to be in balance between domestic production and domestic consumption. So, Peak Oil (maximum production rate) should be considered more of a problem for importers – like the US – when the exporters stop being exporters. The hysteria that has been created by these Ivy League socialists around global warming has nothing to do with protecting the earth’s climate. Nor is it about reducing any of the greenhouse gases now being emitted. The reason for this charade is to create a funding mechanism for the emerging one world government and give it the authority to dictate energy policy over nation states. If you don’t believe me, just follow the flow of money in the house climate bill and it’ll become perfectly obvious to any reader what is happening. The climate change skeptics are the alarmists. They are the one in denial that the climate changes. Hence all the hockey sticks. This is not new though is it? I mean surely Steve already knew he had made those comments, and that the IPCC knoicked them on the head. None of this is new, the divergence is not covered up (there it is in plain text in the comments), the divergence issue has been openly discussed has it not? Now that the bubble has burst on this farce, the powers to be need another “common enemy” to get this one world government put in, I know what that enemy is…. Our next enemy is STUPIDITY, We need a massive new tax and global government to battle STUPIDITY! This farce has proven there will never be a lack of that resource. The most renewable resource in the galaxy. If any of the fraudulent work was done under US government contract, those responsible BY LAW should be barred from future US govt. contracts and grants. The REAL cause of AGW: fortran. @ Jim Watson – Thanks for the chortle. And by the way, that is some island you live on! The audit interest here is mainly papers relied on by the IPCC in their Assessment Reports on *climate* and a few other papers on *climate*. Peak oil is not climate-related AFAICT. If you want to audit stuff on peak oil, go ahead. We won’t stop you. If you had played a role in these climate audits, then you might have been able to beg a favour in return. At this stage, it looks like you are too lazy, or incompetent and so demand that busy people drop what they are interested in so they can do your dirty work for you. twit has jumped on the next fear bandwagon. CAGW is a bust, now they need to scare us with something else. I am a fan nuclear energy and think we need to build reactors like there is no tomorrow (which, of course there will be). The oildrum ignores huge oil finds (especially those on our own soil) and is part of the same fear machine that drives AGW. To paraphrase Fred (18:44:55) , if we do not produce it, we can say we are running out. I refuse to be frightened of what we do not know. Sorry twit. The authors of Rutherford et.al. 2005, by the way, are: Rutherford, S.; Mann, M. E.; Osborn, T.J.; Bradley, R.S. ; Briffa, K.R. ; Hughes, M.K. ; Jones, P.D. ; we’re quite familiar with all these names now. Do you think they used the “hide the decline” trick? Was the divergence problem discussed in AR4? What caused the divergence? Historically, ‘peak oil’ means ‘peak at a particular extraction cost’. If oil is permanently above $80/bbl there is more liquid hydrocarbon available than we’ll ever find occasion to use, whether it comes out of the ground as crude oil, shale, sands, coal conversion e.g. Fischer-Tropsch, etc. Now Briffa is also in avoidance mode. He’s thuper thuper serial about the threat of ManBearPig, too! Half man, half bear, half pig…. This controversy has indeed been hiding in plain sight for years with the problem being that the only ones with enough ears listening to them who might expose it lacked an actual scandal to run with. (2) “Others, however, argue for a breakdown in the assumed linear tree growth response to continued warming, invoking a possible threshold exceedance beyond which moisture stress now limits further growth (D’Arrigo et al., 2004). If true, this would imply a similar limit on the potential to reconstruct possible warm periods in earlier times at such sites. At this time there is no consensus on these issues….” – IPCC Ch.6 of latest IPCC report (AR4) written by Briffa et al. Peak Oil also specifically refers to flowable light oil. e.g. US light oil production peaked in 1971. Even 1500% increases in price have not significantly changed the decline. Peak Oil concept could be applied to each class of hydrocarbons and each region etc. Avoid the confusion of mixing different types of hydrocarbons. Bitumen/tar or coal are very different from light oil. Tim Osborn is the head modeller of the CRU staff. The Berken Oil shale technically has massive amounts of oil, but take 1KG of Camel dung and 1KG of Oil Shale and the Camel dung has more energy. It would take more than 1 barrel of oil to extract, refine and distribute one barrel of oil from the shale. Modern technology can’t overcome the laws of physics and thermodynamics. The canadian oil sands aren’t much better: they are using their gas supplies to create steam to extract the oil and basically swap for oil. This is what peak oil is about: the only oil left is very expensive and available only in small quantities so barrels per day are very low and won’t make up for falling rates from old super giant fields. The oil problem is massive and here we are running towards the cliff looking backwards at a red herring called CO2!#!@#$! The idea of peak oil is uninteresting. It’s largely an economic issue, not a scientific one. Yes, at some time in the future, global oil production will hit a maximum and begin a “long steady decline”. Prices will rise, new extraction techniques will emerge, alternative energy sources will be utilized. However, the disappearance of hydrocarbons from the economy will not happen overnight. The free market should (and ultimately will) handle the transition. As for your statement, “Seriously, we have to change our energy policy and soon. ” – I think most readers of skeptic blogs would agree. For a good example of this thinking, click on the “About” button at the top of this page. Allow me one more excellent story from a major Canadian News paper. The story seems to be picking up steam in that paper. You minted a grand slam in the 9th over the Green Monster with that line. By Monday, you’ll have more hits on Google than sq km of Ice in the Arctic. Provided the Green Monsters don’t kill the free market and plunge the West into the Modern Dark Age, there’s plenty of oil shale, coal and time develop alternatives. We probably need it. 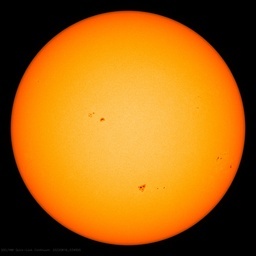 2 years after the first SC24 region and the Solar Activity is still smoldering like wet firewood. We’ve been listening to the “peak oil” scare now for thirty years. It’s lost its legs. Of course one day it will come. So denying it utterly would be particularly stupid. And even if it isn’t soon, not wasting oil is a good idea in its own right. We don’t need to research “peak oil” though. Watch the money guys, and follow their lead. They have the resources and skill to investigate the true situation in places like Iran and sub-Saharan Africa which we do not. When guys like Soros and Buffet start getting rid of all their oil-based investments, then I will suspect it is truly running out. If I am not mistaken our friend Bulldust is a West Australian. – Now world famous. Well now let’s think about this. Nearly every single peak oiler also happens to be a global warmer who advocates the continued and expanded prohibition of drilling and using the vast untapped oil supplies. So they are in effect attempting to cause the peak oil scenario. Of course in neither case is it necessary to have validation. Few if any would argue there’s not a limited supply of oil in the ground. However there are enough vast supplies of oil and natural gas to avoid any “peak” calamity well into the next era of replacement power. The desire to reduce fossil fuel use before adequate and affordable replacement technology arrives is irrational and premature. With technology rapidly advancing new means for powering our vehicles and replacing fossil fuel use the only way peak oil pandamonium happens is if it deliberately caused by another boneheaded movement. All Anthony has done is demonstrate there was no cover up. The point McIntyre raised, the ‘divergence’ problem, has indeed been covered in the discussion the AR4, it is there right now, you can read it if you want. With all due respect, Rod, you’ve got a skewed perspective on the Alberta oil sands. Heck, even wikipedia’s article (search Oil Sands) has a decent breakdown in spite of being “greenpeace-ized”. Alberta’s oil sands contain 1.7 TRILLION bbls of oil. The cost to extract is currently in the low $20s, and it does drop. Just because natural gas is being used in production does not even remotely mean that is the only way, it’s just that Alberta has such a MASSIVE reserve of easily (cheaply) available NG. As someone who lives in Alberta, I’ve been hearing about and following oil sands production my whole life. Everything was great: costs were coming down, efficiency was increasing, until the ! @#$% environmentalists and CO2 obsessors started sticking their ignorant noses into things. Now there is talk about sequestering CO2 and other unneccessary and expensive things. And don’t even get me started on the manufactured outrage about a few ducks drowing in tailings ponds… on the other end of the province are HUGE wind farms surrounded by bird carcasses. ……yeah, i just posed the question because i think when the average joe may hear of ‘peak oil’ they would more often then not think the implication is of a hard limit of hydrocarbons which isn’t realistic (think of the 1.5-2.0Tb reserve size in Alberta as an example) A production bottleneck is the only realistic possibility….but to me it’s overinflated……much of petroleum usage can be replaced with NG usage…this will happen & NG resources are so vast what with the astronomical potential of shale gas drilling i think much of any oil production shortfalls can be made up with NG. IIrc Canada is the only country that currently has the potential to massively increase it’s oil exports over the long term. & there have been huge new shale & deep gas discoveries in Canada/US also. Shhhh! you’re not even supposed to mention that you can’t mention the name of he who can’t be mentioned. It is likely that the oil companies will transition to renewable biomass sources for their hydrocarbon products, but before that, they have 100+ years of coal to gasify first (and that is not counting in-situ pyrolization of deep coal that is not counted in reserve figures), but I believe they have covered that already at theoildrum. I don’t think that Barry will have too hard a time jumping off the AGW train he only jumped on to win the nomination. He was all for Coal-to-Liquid before the campaign. @ Rathyen – Yes, there is certainly something Potter-esque about the whole thing. My partner noted, when she was putting together the little tribute to Ian Harris below, that it wouldn’t be too hard to Hagrid-ise the scruffy Briffa and Dumbledore-ise the omniscient Jones… Because obviously they are the good guys in this story. Sorry, don’t do wunderlabel religion. What has happened here is ‘scientists’ arrogantly playing about with tools they are unskilled to use. Pure and simple. However, you might like to consider what tag language mania (the product of another ‘scientist’ with too much publically funded play time) has wrought on the world. Next up some climate scientist will no doubt release AGWML, thereby increasing warming by wasting another four or five orders of magnitude of the world’s CPU resource parsing indefinite text strings so easily fiddled with at source and over the wire. [C, assembler and security bigot]. Integrity means different things to different folks I guess. 1556: ice sheets extended two miles around the British Isles. There was ice from Dover across to Calais. 1682: All major rivers in Europe froze. 1779: New York Harbour froze. You could walk from the mainland to Manhattan Island. That has been said for nearly 100 years now. In 1914, the Bureau of Mines said U.S. oil reserves would be exhausted by 1924. In 1939, the Interior Department said the world had 13 years worth of petroleum reserves. Then a global war was fought and the postwar boom was fueled, and in 1951 Interior reported that the world had … 13 years of reserves. In 1977, Scold in Chief Jimmy Carter predicted that mankind “could use up all the proven reserves of oil in the entire world by the end of the next decade.” Since then the world has consumed three times as much oil as was then in the world’s proven reserves. Edward Morse, an energy official in Carter’s State Department, writes in Foreign Affairs that the world’s deep-water oil and gas reserves are significantly larger than was thought just a decade ago, and high prices have spurred development of technologies for extracting them. The costs of developing oil sands – Canada may contain more oil than Saudi Arabia – are declining, so projects that last year were not economic with the price of oil under $90 a barrel are now viable with oil at $79. The politicians can’t keep the energy companies from finding more, yet, so they work on preventing anyone from being able to recover the reserves. The companies will find reserves and Congress will prevent any recovery of them. Any “peak oil” is man made. I get tired of hearing every 10 years that we have only 10 years left. It is just as bad as the climate fear mongers. Contrary to your assertion, I think that most, if not all, skeptics do realize that climate changes. It is the attribution of cause upon which the warmists and skeptics differ. I believe the skeptics point of view could be fairly summarized as: there is nothing in current climatic changes that cannot be attributed to natural causes – with possibly a very, very small contribution by manmade sources. We have two positively huge strikes of oil. One in the Gulf of Mexico and one in Brazil in 2009 that practically doubled the amount of recoverable oil estimates. Now Iraq is looking at new discoveries in the Western part of the country and is looking to surpass Iran as the world’s #2 exporting country. Twit, surely the bigger issue is overpopulation. That’s why greens don’t want more technology and more energy–these are what allowed our numbers to escalate so rapidly. (Plus cheap grains from modern agriculture, so we should really be eating meat instead, as we couldn’t support as many people if we all ate meat, which is a bit ironic for the vegetarians who say we must avoid meat to save the planet, as it is the grains that allowed us to overpopulate so fast, so eat the burger and leave the bun, to save the planet). My point is that no matter how obvious or inescapable a future scenario may appear, we are living adaptive complex systems with surprising emergent potentials that are often completely unpredictable. It is telling with peak oil that we won’t know we’ve peaked until sometime after it has happened—-in other words, not only can’t the future be predicted, but apparently not even the present. I posted this on CA but thought for entertainment purposes I’d share it here as well. It’s a reworking of Coldplay’s Viva La Vida, for Phil Jones, et al. F Ross – I think you misinterpret Ripper, my old freo dockers mate from Bigfooty. He means that if “skeptics” is a term of derision, it should apply to people like me who are “alarmists” as we are in “denial”…. he probably should have use the term “deniers” to be clearer… but Rip is no warmist I can tell you that. Disclaimer: the above rendition of Viva La Vida is meant as humor only and is not meant to suggest any illegal acts or inappropriate actions by any party or parties associated with the current situation at East Anglia – since of course we really don’t know definitively know the source or veracity of any of the alleged emails and/or data concerned. Sorry, can’t recall how to create it as a link. I think there’s a graduation across scepticism from those who believe man’s influence is non-existent to negligible, those who think it measurable but not major, to those who think it significant but not catastrophic. With possibly a larger “agnostic” proportion who say we simply don’t know understand enough about climate or havecomplete or honest enough climate data to know whether man is affecting it or how much. That said, and with terminal irony, if there’s one thing almost all sceptics agree on it’s that climate changes. Always has, always will. And it’s those who say “we can’t think of any other reason for current changes except man and we’re pretending pre-industrial changes never happened” who are the ones in denial. I consider your posting to be very relevant. It relates to a question that needs more discussion: Why are so many scientists willing to go along with the AGW scam? First, many scientists are honorable people, who assume that scientists in other fields are equally honorable. The path of least resistance is to accept the artificial consensus, rather than doing one’s homework. Second, most scientifically literate people understand that petroleum is a semi-renewable resource, and that there’s not an infinite supply of the stuff. Yes, there’s a substantial amount of very deep oil under North Dakota. And there are huge supplies of tar sands in Alberta, and in Venezuela. I’m not current on Oil shale, but if and when that technology matures, there’s also a huge amount of OS on the Western slope of the Colorado Rockies. But even these sources are not infinite. And they’re more expensive to extract and/or process than our current oil imports from other countries. People who say that we have plenty of oil are really saying: I don’t care, because I’ll be dead long before the fit hits the shan. It makes sense to be proactive, and to prepare for a soft landing when the price of oil goes through the roof, our agricultural and manufacturing practices become dramatically more labor-intensive, we drive our smaller cars more sparingly, and our living standards decline appreciably. Of course, this will be some time after we recover from the global recession. However my crystal ball is in the repair shop at the moment. And Psychic Larry can’t be specific about the date or even the year. As you point out, there is some degree of overlap between Climate Alarmists and people who are deeply concerned about Peak Oil. Example: Both groups advocate strong energy efficiency measures. Some scientists are inclined to look the other way when it comes to Climate Alarmist pseudoscience, because that brand of codswallop is easier to peddle than a Jimmy-Carter-style energy crisis hanging over our heads at some unspecified time in the future. And if successful, either approach would result in strong-to-draconian energy conservation measures. In their view, the ends justify the means. In the case of AGW, the means include lying and cheating, as Phil Jones and others of his ilk have done over the years, because the Great Unwashed can’t handle the truth. I like that, I really like that I’m gonna send that to Brown et al. Prolly the next scare they’ll try to latch onto. I believe it was back around 2004 that a national energy report was written for USA energy policy decisions. That high level document stated that we have enough oil just in oil shale alone to serve the entire oil needs of the USA for over 100 years. Not to mention Canada’s oil sands, which is pretty large also. We’re sitting with producing oil wells capped off California (and Florida??) because of drilling restrictions. Sitting on undrilled oil in Alaska. The Obama Admin is holding up licensing of others that could be drilled – a number of which were approved shortly before he took office, but they’re holding those up also. Proven oil reserve figures, historically, wind up being significantly low relative to the oil that winds up being extracted. Up until the recent oil price spike, there was little point in much searching for new supplies – since then, there’ve been something like 200 finds including the large offshore Brazil find. Peak oil? Is the sky falling? Think I’ll camp out tonight. This chronic oil depletion crisis happens to be occurring in parallel with climate change awareness, although peak oil has gotten much less publicity. However, the window of opportunity is closing fast… the AGW “science is settled” propaganda is falling apart at the seams while people are beginning to notice that global temperatures are cycling downwards [probably until 2030] … nature has this habit of putting man in his place… so fingers crossed we avoid the double whammy of cooling plus massive new energy taxes. The shame of it all is that the published numbers behind Peak Oil are as reliable [for all the same reasons] as the numbers behind AGW… and if you listen to some Russians there is not even “settled science” regarding the origins of oil deposits… but we don’t talk about that either in polite society. Having Spent the last 28 years drilling for oil in nearly all the oil producing countries in the world, I would think that my great great grand children will not be feeling the decline of petroleum products, the USA has more oilfields designated as ‘ Strategic Military Reserves’ that could be used in the next 500 years, the world is a big place and if we have discovered more than 5% of the oilfields that exist under or feet I have wasted 28 years of my life. Oil and climate have nothing to do with each other in the last analysis. However, I remeber the oil crises in the 70’s when OPEC tripled the price. Since then there’s been a plentiful supply. Mrs Thatcher was at war with oil barons and coal miners during the 80’s, and coincidentally the Hadley Centre was established in 1990, shortly after and Hansen gave his testimony to Congress in ’88. It could be said that a relation between oil/fossil fuels and climate was created during the course of this period. Climategate is a catchy one, Climaquidick less so. Some phrases seem to invent them selvs. What about “Mannmade global warming”? Changed meaning of “climatesmart”? =Clever at making hockeystix? The refrain: “Hide the decline” is kind of sticky. Still we await some more durable results. IPCC should be redesigned and a scientific board without “consensus”. The meaning of that word also has changed. It seems to be approaching “squelched” or something. The person who rejected it was Briffa himself. Just check the AR4SOR_BatchAB_Ch06-KRB-1stAug.doc. Or is that some other Keith? Good try, Andy, but you can’t claim coinage of “climategate.” I am sure it popped into the heads of people world-wide instantaneously. In German TV-media there’s nothing about climategate. Everything is calm but the ZDF, one of the more or less official German TV-Stations, yesterday evening proudly announced the public that China will reduce CO2-emissions until 2020 in relation to 2005 for 45 %! No information from the ZDF what this relative reduction really means! GDP 2020 in relation to 2005: 364 %!!! CO2 reduction GDB-based 45 % means absolute CO2-emission in 2020 in relation to 2005: 200 % !! I’d read much of the reviewer notes and requests a year or more ago and was appalled then by what was being rejected…noting that Fred Singer seemed a popular target. I’ve lost the link to that whole part of the AR4 process, and would love to have it again, especially now. What I think is critical now is to know who the specific individuals were that, on behalf of the IPCC, were those who made the decisions, that is, who were these guys? Was it the lead authors of the respective chapters?? You may be right; I puzzled for some time over Ripper’s post before making my response. If the interpretation of his post is as you say, my apologies. Good post. Your summary of the range of skeptical positions is clearer than mine. The only hope, w/regards to both oil reserves AND C02, is that the personal consequences become so dire that individuals actually spend some time to educate themselves and look beyond the 60sec sound bite, and then find a way to take the appropriate action. Myths like Mt. Kilimanjaro and polar bears floating around on chunks of ice need to be dispatched effectively. There are still people that believe that Mr. Kilimanjaro is losing it’s snowcap because of warming, rather than deforestation at the base. Getting people to take the time to educate themselves, and then presenting them with a path to take action on the issue. Btw, when that happens (I don’t think that’s an “if”), the U.S. Congress should beware, because they’ll be out of a job in a heartbeat, along with a lot of other pols. I’m noting wryly that Steve failed to mention… that he was the reviewer who said “don’t cover up the divergence”. Twit – I would like to see this issue opened up for debate beyond folk saying “this IS how it is” because I smell issues as well as questionable science, but am also fairly ignorant, and getting lots of perspectives helps me at any rate in digging deeper for key evidence. But not right now. The frauds constituting ClimateGate are a threat to the foundations and fair practice of Science altogether, and that includes the sciences involved in oil issues. To say nothing of the threat to democracy, to ridiculous action for no result, etc. This spectre of GROUP_THINK needs to be exposed, so that people can see how widespread it is, how easy to fall into, and how dangerous. Jim Jones showed that; so did Hitler. First reference that I know of occurred in a 1934 U.S. Geological Survey study. They alluded to there being less than one generation’s supply of oil (15 years worth). I think it’s unfair to associate global warming sceptics with peak oil deniers, we all know that oil is finite. However, there is already a market system in place for energy. As oil gets more scarce, it’s price goes up, and we cut back . In 1998, oil was $10 \ bbl, so nobody was exploring for it, hence no new discoveries. When it did go up, not only did we find more of it in the Gulf of Mexico and Brazil among others, we also found ways of extracting more from existing oil fields. Most oil companies extract the easy 1/3rd from a well i.e. the stuff that pumps itself, and then move on. The North Sea fields were supposed to be depleted in 1998, latest estimate is now 2025, because of new extraction techniques. Gas is currently so cheap, it’s not worth their while putting in the pipelines to distribute it. But as oil depletes, that will change. There’s between 130 – 420 years of coal reserves (depending on where you look for your information). At worse, that can be converted into a form useful for transport. Then there’s methane clathrates, of which there is something like 2trillion bbl equivalent. Extracting that now is prohibitively expensive at current prices. But at higher prices and with newer techniques, that can become viable. And then there’s renewables, which are already viable here in Europe, with energy taxes so high ($8 for a gallon of petrol). Eventually we will reach a crossover point where renewables become viable everywhere, particularly if we can crack the storage problem. So it’s not so much that we’re denying the problem exists, it’s that we know if the market is allowed to work efficiently, it will sort it out for us. twit: The oil depletion problem has been predicted over and over again, so this has become a clear example of the “Boy who cried Wolf”. Unfortunately, oil will come to an end at some point, and other nations like France are now 80% nuclear (a great hedge even if AGW was true). Unfortunately, in this country the party in power sees lots of money and power betting on renewable fuels that still produce GHGs (the glaring disconnect with their own AGW beliefs doesn’t seem to bother them). This strategy will waste the means of production that could go to feeding the world’s hungry on making fuel, not to mention that it can’t possibly replace oil fast enough, which cuts back to the laughable complaint that nuclear plants take too long to come on line. Even if oil is at its peak production, don’t forget gas and liquid diesel type fuel can be made from coal. Not a new technology, Germans ran their tanks and jet aircraft with in during WWII. Lots more expensive than oil though. ….so we need to include all relevant papers that agree with our predetermined view. ?? Do I seem to recall someone saying that they were going to keep something out??? …..or have I made a bubu?? Sorry for violating the 3-in-a-row posts rule…but Dr. Sir Brian would seem to demonstrate a preconceived conclusion to the outcome of Chap 3, IMHO….which would make me suspicious of the motivation for his acceptance or rejection of anything, since he should be scientifically neutral and clearly isn’t…and wasn’t. The IPCC has a built in bias. The problem with peak oil is not reserves – it is production. In the classic (M. King Hubbert) study at the instant production peaks, there is approx 50% of the oil left (as a rule of thumb). However production declines year on year from there on. It should decline roughly symmetrically. However, with modern innovations such a horizontal drilling etc, the production peak is delayed. This leads to asymmetry and a much more precipitous decline in production. If yesterday you were producing (and consuming) 1billion barrels of oil, and today you are producting (and consuming) 999 milion barrels, then someone will have to do without. They are encouraged to do this by rising prices. There are a lot a beneficial effects to raising prices – just the consumer never sees any of them. Peak oil is not the end of oil – it is the end of cheap oil. On the bright side, the coming depression will make oil very cheap by killing demand – a final hurrah if you like. But it will never be as cheap again after that – in inflation corrected terms. The problem of every 10 years, there being only 10 years of reserves is kind of obvious – they stop looking. Exploration is expensive, and if you know what you’re going to be doing for the next decade, then why bother looking? Scientists doing studies on how we’re all going to die, didn’t really understand this alas. Oil is not the only mineral that seems to be heading towards a peak at the moment – there a quite a few. From the not-so-vital like gold, to the very vital like phosphorous. OK, I see the “Running Out Oh Noooo!” topic is afoot again. We can make a few hundred years worth of “oil” from various materials (coal, tar sands, natural gas) at prices roughly the same as today in the USA (that is about $2-$3 / gallon of gasoline equivalent) when that runs out we can make an effectively unlimited quantity from any of: trash, algae, tree farms…. No, it is not hypothetical. Yes companies are doing it today (I own stock in several from time to time, one RTK Rentech is turning LA trash into fuel for the ground equipment at LAX airport ). No it dose not require 20 years more R&D (and no it does not require a new fuel infrastructure like Hydrogen). And per “peak oil” meaning an “oil crash”. Not going to happen. The curve is roughly a bell curve. We took 150 years to enter and it will take 150 years to exit, more or less. Even now the worlds “depleted” oil fields have about 1/2 their oil still in place. APA Apache regularly takes over “empty” fields and “finds more oil” via advanced recovery techniques. There is no energy shortage and there never will be. Get over it. There is, however, a shortage of common sense and a willingness to act responsibly and build energy production facilities. That may lead to a product shortage, but we are still up to our eyeballs in energy sources all at reasonable costs. And we always will be. (If you dispute that, see the links, and don’t clutter up this thread with OT energy junk). John Phillips (13:05:03) : Even if oil is at its peak production, don’t forget gas and liquid diesel type fuel can be made from coal. Not a new technology, Germans ran their tanks and jet aircraft with in during WWII. In South Africa SSL Sasol has being doing Coal to Liquids for about 1/4 century. If you use “petroleum” in S.A. than the F.T. process. RTK Rentech is using the same thing for the LAX fuel. SYNM Syntroleum is turning Tyson Chicken fat into fuel too. And the prices are NOT more expensive than oil. They were back when they cost $100 /bbl and oil was $20. Now oil is $70 to $80 and the process costs have been driven down to about $50 (or maybe less). It is now economic and profitable to make oil from coal and trash. South Africa did it just to be free of external threats, so cost is not the only issue. But it IS NOT MORE EXPENSIVE and when oil was at $100+/ bbl it was much cheaper than oil. @ E.M.Smith (20:28:03) : -SNIP- Um, Saudi just did their first real production expansion in a very long time. Added a few Billion bbl / DAY of capacity. E.M., I don’t suppose you happen to have a link for that info? I’ve a friend who’s been on about peak oil for quite some time and I’d like to send him that juicy tidbit. 🙂 Prolly won’t make any diff, unfortunately – he’s a ‘true believer’ type about a number of these things, but I try anyhow.